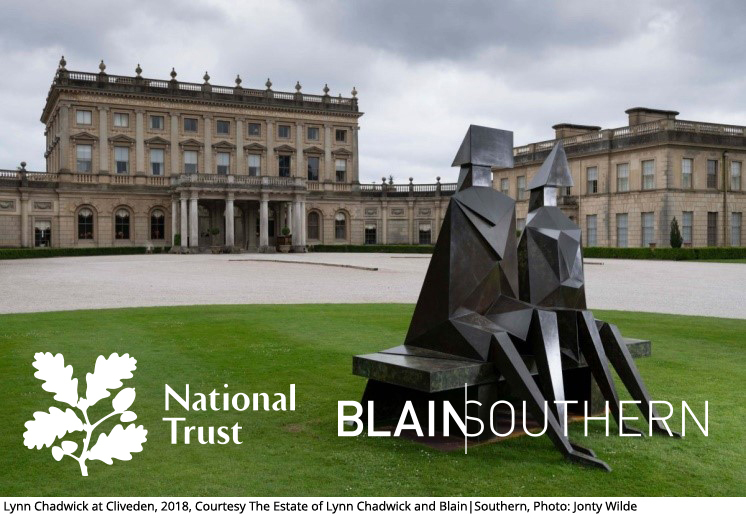 This year, in partnership with Blain|Southern, the National Trust is hosting an exhibition of the works of the renowned British sculptor, Lynn Chadwick (1914 – 2003). We invite festival goers to take a private tour of the exhibition with National Trust curators and learn about the life and work of one of one Britain’s most intriguing modern sculptors. Private tours will run on Saturday and Sunday, at 12:45-13:30 and 13:45-14:30. There is no charge for the tours but donations to the National Trust are welcome and can be made at the NT desk in the Box Office. As spaces are limited advance booking is required. Please click here to book. Please note you will need to have a valid Festival ticket in order to book the tour. In 2012 National Trust began a five-year, £6 million restoration project on the South Terrace which included removing damaged rendering from the walls of the Sounding Chamber. This process revealed hidden light wells in the inside chamber ceiling and a doorway in the exposed brickwork. One theory is that the space may have been the entrance hall from the original 1670s house. We believe there is no earlier example in England of a room of a complete ellipse with an elliptical dome. Although the original function of the chamber is not yet fully understood, the rare spatial form tells us that this was a space of considerable significance. Now restoration work has been completed, you are invited to enter this unique room, one of the few elements of the seventeenth century house to have survived two devastating fires.